BrainFizz - Routing, Making, Custom projects & Training. 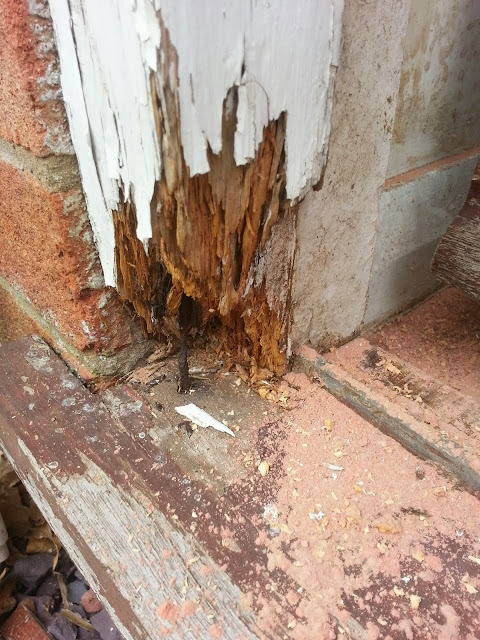 : Avoiding the rotten prices associated with rotten windows and doors. 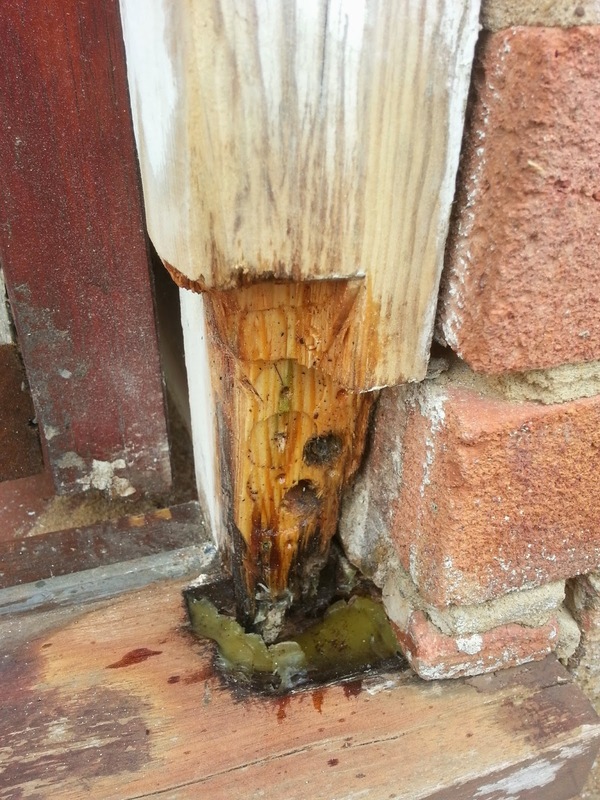 Avoiding the rotten prices associated with rotten windows and doors. 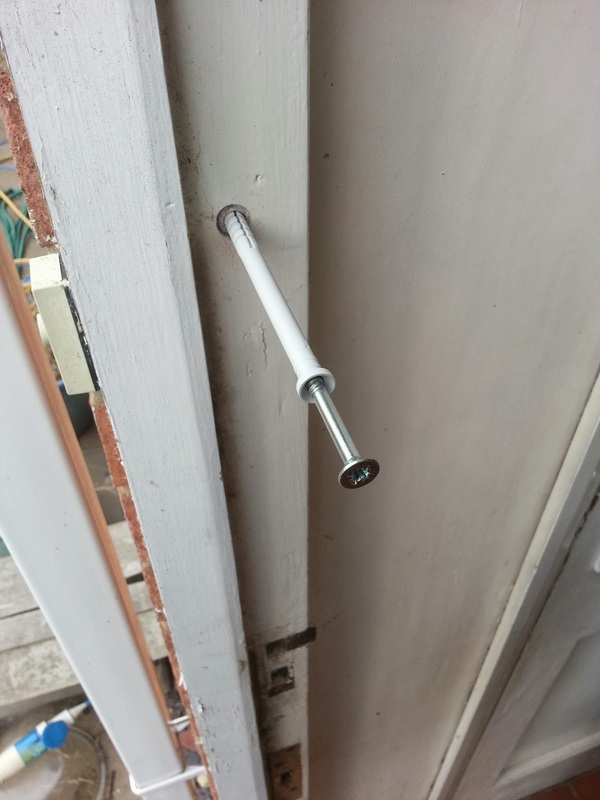 So Whats better than having to pay someone to refit a new door frame, re-hang the stable door, and paint? Well doing it yourself of course! 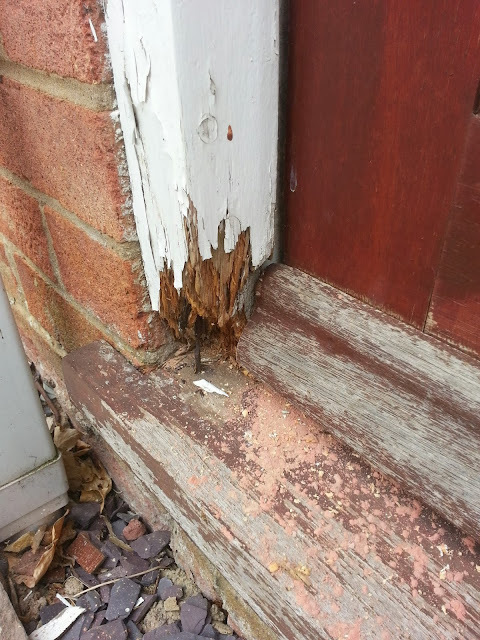 If you have wooden doors, or timber window frames, firstly LOOK AFTER THEM! They need a bit of maintenance every now and again, and If you can spare a little time and effort, get the paint brushes out every once in a while, and give them a little protection. Anyway, that's not the point of this post. As you can see, this frame is completely shot, the "rusty nail" is actually a No.10x3" screw - or whats left of it! It's been painted, several times, but It's not had a coat for some time, and to make matters worse, it's on an exposed side of the building and takes the brunt of mother nature. Harsh wind and rain in the winter, sun all day in the summer, literally one extreme to the other. So you might be thinking that the whole frame needs renewing, a big, time consuming, and specialist job for a professional. But actually it's not quite as bad as all that, just yet. Still not cheap, (about £100 for materials), which is less than the cost of a new frame. But the best bit, you can get this done in a couple of hours, and be painted the same day. AND YOU CAN DO IT YOURSELF! One of the first things I noticed was the fixing of the frame to the brickwork was a little "weak", so I decided to refix it with some Hammer fixings. Lukily I had four left over from something previous, so I just Drilled the correct size hole, hammered the fixing in and tightened with a screw driver. 4 in total, all safe and sound! Now before you scroll down any further, I should point out that this is not a how-to post. It's a what-I-did-post. HOWEVER, I did say it's a DO-IT-YOURSELF job - which It really is, but I'm going to assume you either have a degree of "natural apptitude" in such endevours. 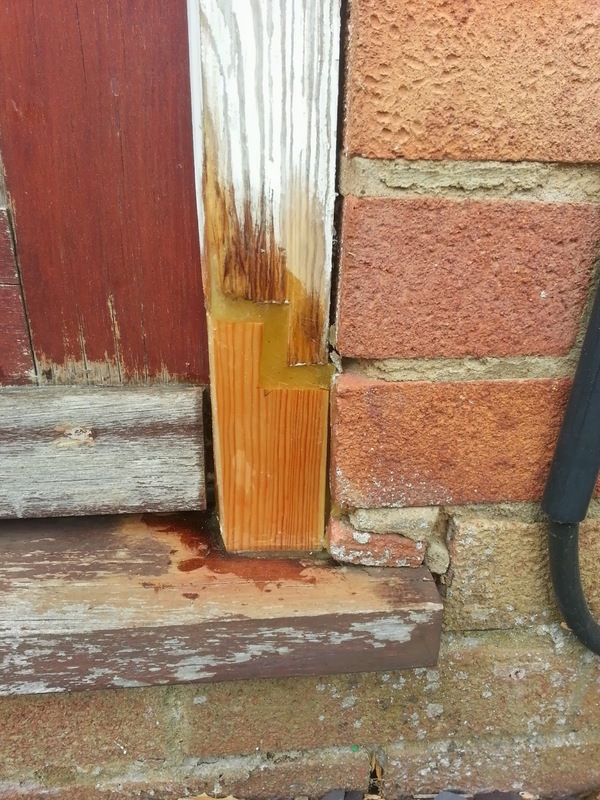 Furthermore, if you've not tried anything like this before - rotton wood is rotten - so it has to GO, this means making the damage look worse before better. Think of it as a bit like dentistry. Both sides of the door frame were totaly shot and needed the same treatment, about 90% of rot in windows and doors etc occur round the bottom - for obvious reasons.All the rotten timber had to be completely removed from the area, Whatever type of repair you carryout, the yuck has to go, as it weak, and nothing sticks to it. It's a bit like putting duct tape on a dusty floor. the picture above shows all the rott having been either drilled or chiseled out. The company that make this repair kit also sell a giant oversized manic dentists drill type monster machine, basically a long router, with a 1/4" straight or cove bit on the end to play dentist with - but TBH, that just seemed like using a cannon crack a walnut. It's also expensive, and, well I already have a few chisels and forstner bits! You can also see a bit of the stuff used for the repair - I was concentrating on the repair not the camera. So Whats the stuff I used then? 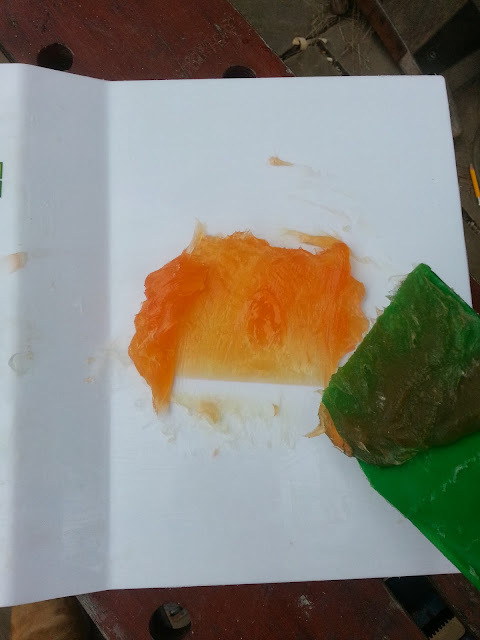 Well It's a 2 part resin mix, actually it's kind of a 4-part resin, as there's 2 parts to the 2 parts. There's actually 3 variants of these as well in terms of set-time, but thats means the maths becomes more than being able to keep my shoes on, so we'll keep to "it's a 2-part resin system". So as i said, the system comes in 2 parts, everything is available seperately. But you can do as I did, and buy a trial pack, which contains everything you need for a repair. including a really cool double barreled caulking gun, mixing and spreading spatulas, little wooden sticks, and coffe cups to mix the liquid part in, a board to mix the main resin on, gloves and wipes for cleaning up. ALSO the most important thing, an instructional DVD to explain how the system works, and what order to work in. Yes you can read the print on the tubes, but actually it's a really good DVD, and since it's all in the the pack of everything you need, I gave it a watch. What really surprised me was just how easy it was to work, it has the consistancy of "quite hard ice cream", when it's been out the freezer a little while, it holds the shape you give it very well, but at the same time is easy to shape and mould to match the profiles you have. It also works really well as a sort of morter, so you can splice in pieces of timber. 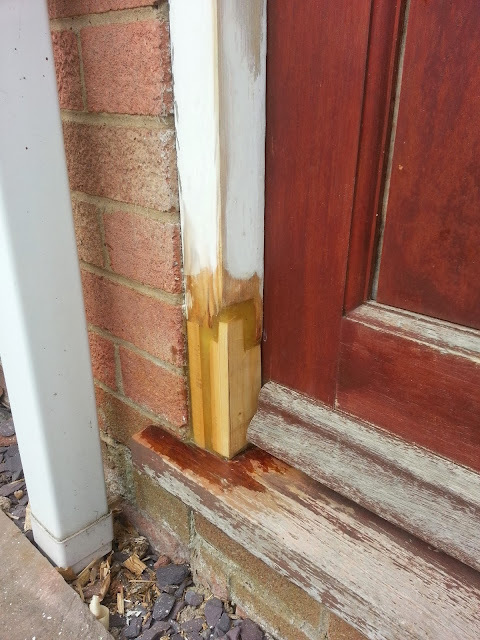 This is great, as if it's a bit hole you're filling, you can keep the cost down by splicing in bits of wood, as i did here. 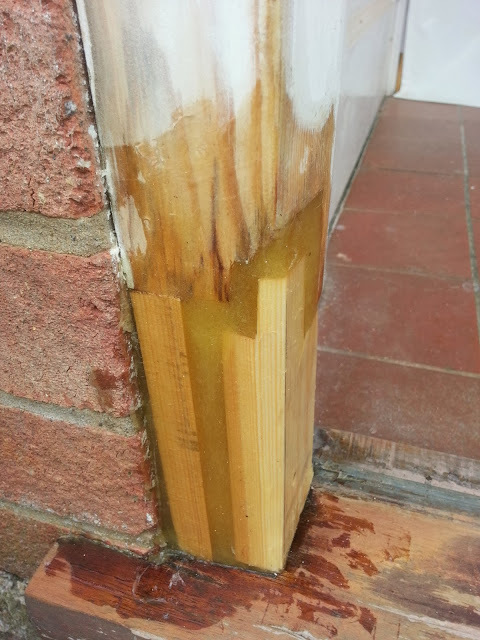 It aslo means you can use the straight edges of timber on the corners, thus making live a little easier than if you tried to create a profile with just the resin. I'm really impressed with this stuff, and first impressions are out standing. MUCH cheaper than a new frame, and the application areas are far reaching! paint and stain able, flexible, rot-proof, and it can be drilled, sawn, routed etc just like wood. Not sure about it's availablility wordwide, but for anyone here in the UK, It's definately worth a look at! Just do a google search for "repair care" or "dry-flex". Go save yourself some cash!